Improving your home with double glazing is a sure-fire way to reducing your household energy bills and making your property energy efficient. Wooden windows are a favourite amongst homeowners with their fantastic traditional look. If you want to see cuts to your household expenses, wooden double glazing is a great option. With doors and windows being two of the main areas for heat loss, double glazing is a viable way to slash bills. Double glazing works by restricting heat loss with an efficient gas spacer. The spacer, usually Argon, Xenon or Krypton, is inserted between two panes of glass and heat can’t pass through because of its motionless properties. For heightened energy efficiency the spacer is often between 20mm and 28mm in thickness. Complete with wooden window frames you’ll have something that looks aesthetically pleasing. Wooden window installations are more often seen in traditional homes, where the exterior look is important to maintain. In these circumstances uPVC and aluminium simply wouldn’t suit. See a reduction in noise pollution that’s able to enter your home, with the same efficient spacer that restricts heat loss. This is fantastic for homes situated in busy areas. 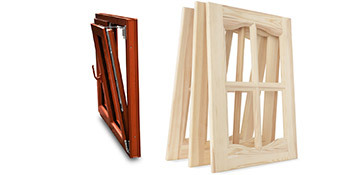 Why choose wooden double glazing windows? The main advantage with wooden windows over aluminium or uPVC is the aesthetic appeal they have to offer homes. Properties with the traditional look and feel will benefit significantly from wooden frames rather than the other options available. Wooden windows are also great for energy efficiency, achieving better results than aluminium and they’re also recyclable, which is fantastic for the environment. If you’re interested in wooden windows it’s best to receive a number of quotes to compare prices and ensure you get the best deal for your money. Project: Customer visited the mywindowsprices.co.uk site and submitted an enquiry. Glazing type: Double, Work description: 2 x 3-casement wooden windows plus French doors, leaded glazing.